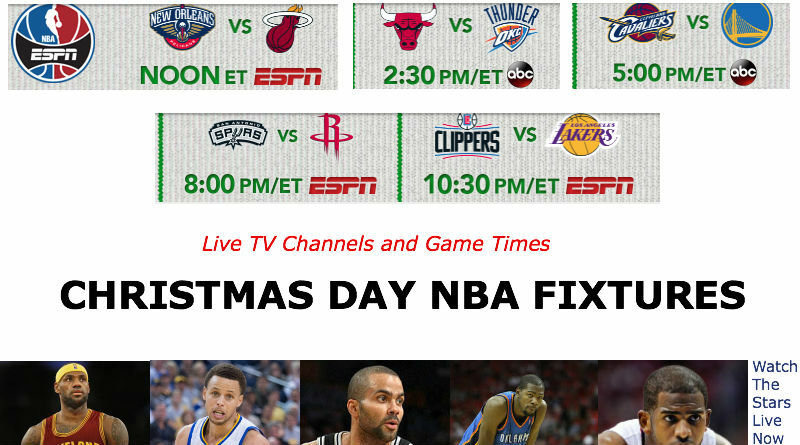 MIAMI, FL, Sporting Alert – The Christmas Day fixtures are well upon us, and basketball supporters are now fixing to watch what is expected to be a very entertaining day in the NBA on Friday, December 24. Before these fixtures tip-off, we will take a look at the players who are expected provide the main punch for their respective teams. The full schedule is listed below, while two of the top games will be streaming live on ESPN3. At the AmericanAirlines Arena in Miami, Florida, the Heat will take on the Pelicans looking to rebound from the narrow 93-92 defeat they suffered against the Piston on Tuesday night. At the same time, New Orleans is on a two-game winning streak and has won three of four. KEY PLAYERS: Anthony Davis NO – PF (23.4 PPG, 10.8 RPG, 1.4 APG). The likes of Dwyane Wade and Hassan Whiteside have been important for Miami, but Chris Bosh MIA – PF (17.6 PPG, 7.9 RPG, 2.2 APG) is perhaps the player to watch for Miami. At the Chesapeake Energy Arena in Oklahoma City, Kevin Durant and the Thunder will battle with Derrick Rose and Chicago in the second game on Christmas Day. The Bulls are on a poor run at the moment, losing its last three games, while there are signs that something isn’t right internally between new head coach Fred Hoiberg and some of the players after the Jimmy Bulter criticism. The Thunder, on the other hand, are heading in the right direction after beating the LA Lakers twice and the LA Clippers in their last three games. On Christmas Day, Oklahoma City goes for its fourth consecutive win. KEY PLAYERS: Jimmy Butler CHI – SG (21.5 PPG, 5.0 RPG, 3.3 APG) AND Russell Westbrook OKC – PG (25.3 PPG, 6.9 RPG, 9.3 APG). Unquestionably, this is indeed the game most basketball fans have been waiting to see since the NBA fixtures were released earlier this year. There have been some thrilling games in the past on Christmas Day, and this battle, a repeat of the last year’s NBA Finals, is set to join the list of entertaining matchups on Dec. 25. The Cavaliers seek their seventh successive victory on Thursday, while the defending champions Warriors are on a three-game winning streak. However, don’t forget that the champs had won 24 straight games this season before losing to the Bucks and have looked like a team ready to build another undefeated streak . KEY PLAYERS: LeBron James CLE – SF (26.4 PPG, 7.6 RPG, 6.3 APG) AND Stephen Curry GS – PG (31.2 PPG, 5.4 RPG, 6.3 APG). The battle of the men in Texas. San Antonio has been dominating under the radar this season. The Western Conference giants have already won 25 games this campaign and many experts are backing them as the team to watch in the NBA title race. The Rockets have been inconsistent all season and you never know what this team will do on Christmas Day. KEY PLAYERS: Kawhi Leonard SA – SF (21.0 PPG, 7.4 RPG, 2.7 APG) AND James Harden HOU – SG (28.8 PPG, 6.0 RPG, 6.8 APG). It’s probably a very good time for the Los Angeles Clippers to be playing city rivals LA Lakers. Doc Rivers side has been underperforming this term — especially in the fourth quarter — and is on a three-game losing streak after dropping matchups against the Spurs, Rockets and Thunder. They have no one to finish off games the experts say, despite having the likes of Chris Paul, Blake Griffin and even Jamal Crawford in the setup. At the same time, though, the Lakers are just a mess again this season — losing three of the last four and nine of the last 11. KEY PLAYERS: Blake Griffin LAC – PF (23.6 PPG, 8.6 RPG, 4.9 APG) AND Kobe Bryant LAL – SF (17.4 PPG, 4.1 RPG, 3.5 APG).